Semtech Corporation (Nasdaq: SMTC), a leading supplier of analog and mixed-signal semiconductors, will exhibit at the 2016 China International Optoelectronic Expo (CIOE) at the Shenzhen Convention & Exhibition Center on September 6-9. The Company will highlight its diverse portfolio of optical networking solutions for a variety of high-speed optical communication applications in booth 1C01. 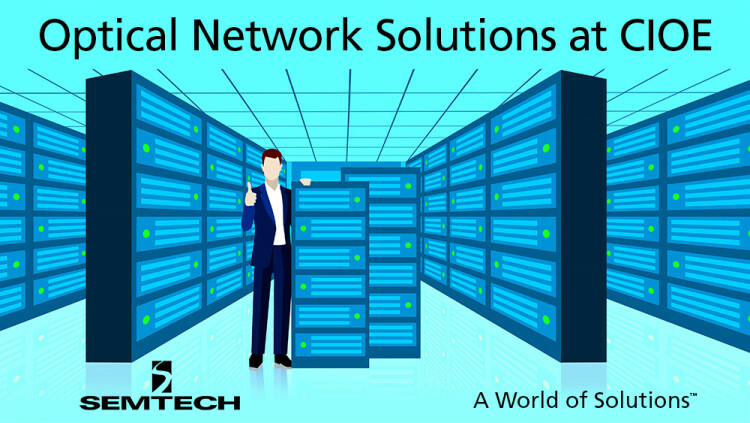 Semtech optical networking products enable a wide range of next-generation networks by providing high performance and reliability using innovative integrated designs. Semtech will be demonstrating selected new integrated circuit (IC) products for datacenter, enterprise and passive optical network (PON) applications at the show. Additionally, Allard van der Horst, Principal Product Definition Specialist for Semtech’s Signal Integrity Product Group, will give a presentation on the past, present and future climate of optical transceivers and related ICs entitled “Optical Communications ― Feeding the Need” on September 6 from at 4:40 p.m., local time, in ROSE Hall 5, room 3, of the Shenzhen Convention & Exhibition Center. Contact David Guerra to schedule a meeting with Semtech’s Signal Integrity Product Group at the show. Visit www.semtech.com/optical for more information regarding Semtech’s optical products. Established in 1999, CIOE is the largest show of its kind in the world featuring over 2800 optoelectronic enterprises and their latest products in the area of 105,000 sqm at the Shenzhen Convention and Exhibition Center. There are concurrent specialised expositions focusing on Optical Communications and Sensors, Lasers and Infrared Applications, Precision Optics, LEDs, Sapphire Technology & Touch Screen and Smart City. To learn more about CIOE, please visit www.cioe.cn. All statements contained herein that are not statements of historical fact, including statements that use the words “will,” “look forward to” or other similar words or expressions, that describe Semtech Corporation’s or its management’s future plans, objectives or goals are “forward-looking statements” and are made pursuant to the Safe-Harbor provisions of the Private Securities Litigation Reform Act of 1995, as amended. Such forward-looking statements involve known and unknown risks, uncertainties and other factors that could cause the actual results of Semtech Corporation to be materially different from the historical results and/or from any future results or outcomes expressed or implied by such forward-looking statements. Such factors are further addressed in Semtech Corporation’s annual and quarterly reports, and in other documents or reports, filed with the Securities and Exchange Commission (www.sec.gov) including, without limitation, information under the captions “Management's Discussion and Analysis of Financial Condition and Results of Operations” and “Risk Factors”. Semtech Corporation assumes no obligation to update any forward-looking statements in order to reflect events or circumstances that may arise after the date of this release, except as required by law.